Fall is a beautiful time of year. At Augustana, the fall season brings with it many reasons to be thankful. 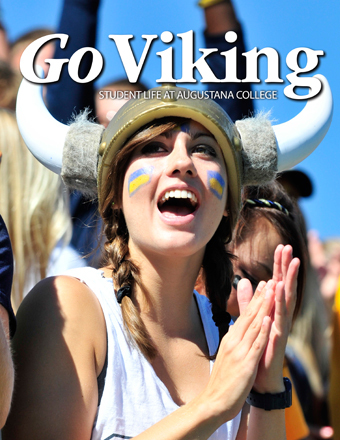 Our campus comes to life with the addition of a new freshmen class and the return of our upperclassmen, primed and ready to kick off a new year as Augustana Vikings. Across campus, professors and students can be found engaging in conversation — the essence of the community at Augustana. The energy and excitement surrounding the start of the year is palpable. That energy resonates throughout the year, as students are continually exposed to the endless opportunities Augustana has to offer. The annual Boe Forum on Public Affairs brings in world class speakers such as Jared Cohen, Director of Google Ideas. Each spring, Augustana and its sister schools host the Nobel Peace Prize Forum which features Peace Prize Laureates and other peace activists from across the globe. Augustana’s 97 student organizations, each formed and managed by students, sponsor hundreds of events throughout the year. The Union Board of Governors, Augustana’s premier programming group, sponsors nearly one hundred events each year. When combined with Recreational Services and Residence Life programs, every weekend is packed full of college-sponsored activities. Our students stay on campus because Augustana invests in meaningful and invigorating programs that students love to attend. The arts are alive at Augustana. Take a stroll through the Humanities Center any night of the week and your ears will fill with sounds from one of our wind, choral or string ensembles. Our ensembles are composed of students from all majors and disciplines, who combine to create a rich and diverse experience. Augustana’s theatre produces numerous productions, which involve actors, musicians, designers and technicians. The beautiful Center for Visual Arts houses studios for printmaking, sculpture, painting, ceramics, drawing and graphic design, and includes a gallery for professional and student exhibitions. Augustana’s arts are cherished not only on campus, but also in the greater Sioux Falls community, providing students the unique opportunity to gain exposure to employers and graduate schools. As I begin my fourth and final year at Augustana, I frequently find myself pausing to reflect on my time spent on this great campus. I could have never anticipated the impact the past three years at Augustana would have on my life. 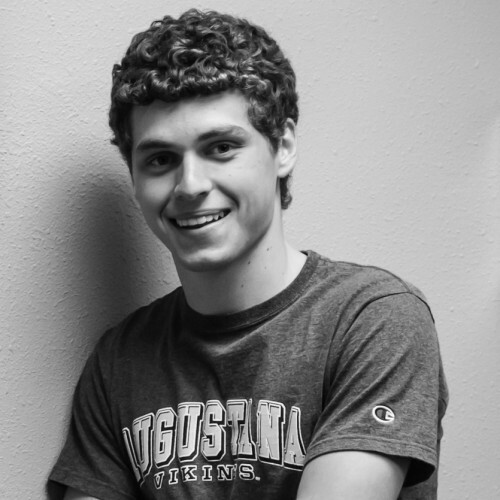 From the beginning of my freshman year in Bergsaker Hall, Augustana has ignited in me a passion for learning. By far the most important lesson I have learned is that knowledge is not measured by the number of right answers one has. Rather, it comes from the ability to ask difficult questions — the kinds of questions that have ultimately strengthened my faith, friendships, and my outlook on life. Lessons like this will extend far beyond my four years here. I have forever been changed by the friendships I have made on this campus, not only with fellow students but with professors and administrators. It is hard to walk across campus without running into at least a few people who are excited and ready to strike up a conversation. Professors, such as Dr. David O’Hara (Philosophy), always have the office door open (and in Dr. O’Hara’s case, the water hot, inviting students to come share a cup of tea) for candid conversations. Dr. Jim Bies, Dean of Students, can frequently be found sharing a table with students in the Ordal Dining Room. President Rob Oliver attends nearly every performing and visual arts, chapel, and athletic event. Students and faculty alike are invested in and passionate about Augustana. Some would describe this as the “Augie Advantage.” Others would tell you it is just another example of the community at Augustana. No matter what you want to call it, this is exactly why I fell in love with Augustana — and it is precisely why I am proud to say that I chose to Go Viking.